About 80,000 years ago, the last and largest glaciation, the Wisconsin, began. The Great Lakes Region was covered by the Laurentide Ice Sheet until approximately 20,000 years before present (B.P.). The impact of the Wisconsin glacier and its subsequent melting has literally sculpted the physical geography of the Park. Vast deposits of sand, rock and cobble were left by the receding glacier. At the same time glacial melt-water flooded vast areas of the Great Lakes basin. These deposits of ‘glacial till’ were then re-shaped as the waters of the glacial lakes receded from initial depths 90 metres above the current Georgian Bay shoreline. Awenda contains many remnants of glaciations. The retreat of the glacier left behind evidence of isostatic loading and rebound, glacial lakes, kettle lake formations, and erratic boulders, all of which have influenced the Great Lakes shoreline. 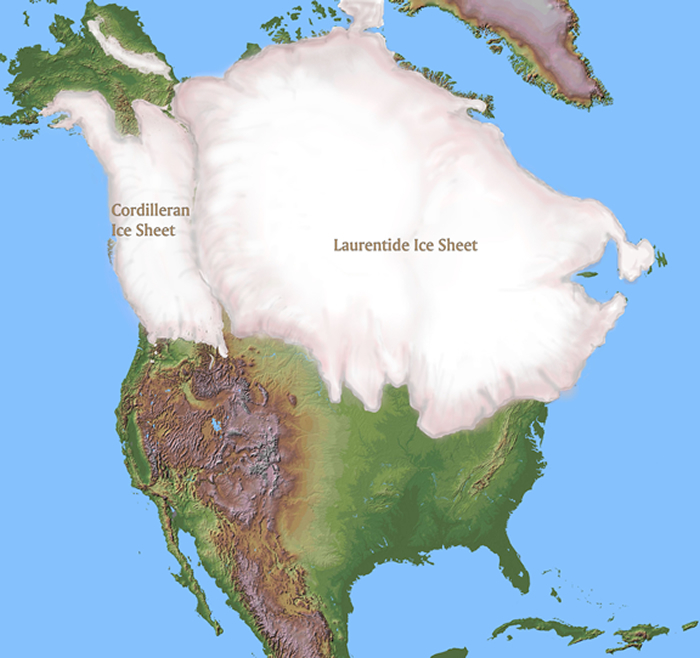 The Laurentide Ice Sheet. Image courtesy of Cosmographic Research. An erratic is another term for a remnant boulder, usually made of granite or gneiss from the Canadian Shield, which has been left as a surface deposit. These boulders have been carried by the movement of the glacier and left behind as the ice melted. Erratics are often found together, creating boulder fields, and can be seen throughout Awenda. One good spot to find erratics is along the Beaver Pond Trail or Nipissing Trail in the lower park. Interested in Awenda’s geology? Check out the Friends of Awenda sponsored Geology Challenge! There are 10 stops along the park shoreline in this self-guided hike . Each reveal a something about Awenda’s geological past from the Canadian Shield down to the sand you stand on!